When listening to music on your computer, you can go several different ways. The first is to use a huge, well-known music player such as iTunes or Windows Media Player; the second is to opt for streaming using Spotify, Pandora, Last.fm, and others; and the third is to go for a smaller, lesser-known player that suits your exact needs. 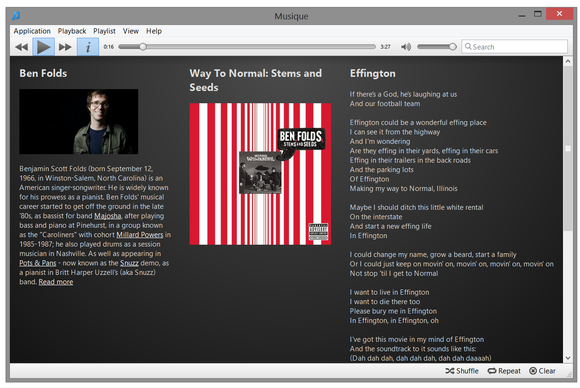 Musique (€8.99/$12 after 20-day free trial; Linux, Mac, and PC) is just such a player, and one that is definitely worth your attention. Simple yet eye-catching, Musique is everything you always wanted from iTunes and were afraid to wish for. 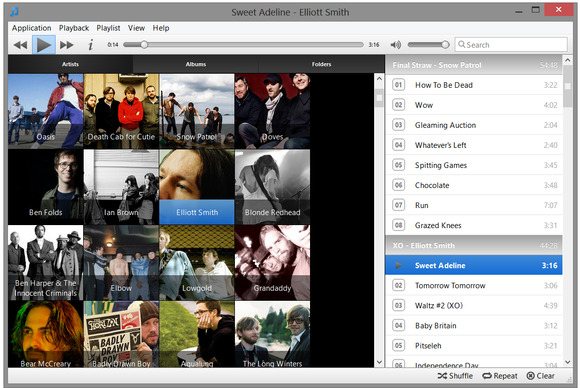 Interface-wise, it loosely resembles old versions of iTunes without any of the confusing elements. Right from the get-go, using Musique is completely straightforward, with clear buttons and keyboard shortcuts to accomplish any task. The free version of Musique is a demo that lets you add up to 15 tracks at a time, and pops up a nag screen every few songs. It also expires after 20 days, so it's really only a trial version. When you first launch Musique, you'll need to point it to your music folder for a scan. Musique uses Last.fm to catalog your music, bringing up album covers, artist information and photos, etc. Once done, Musique will present your collection in beautiful tiles which you can view by artists, albums, or folders. The right side of the screen is where your playlist goes. 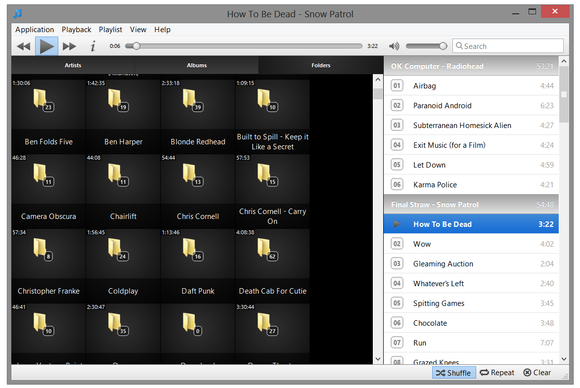 Simply start dragging artist tiles, albums tiles, folders or individual songs to this pane to create your playlist. Alternatively, you can hit the play button on the tile itself to automatically start playing everything it contains. 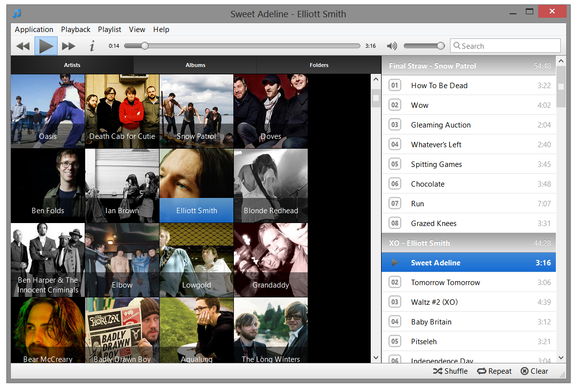 You can also use the search function to find specific songs, albums or artists you're looking for. The playlist supports all common functions such as shuffle and repeat, and you can easily control everything from your keyboard or use the buttons and menus. For any song playing, you can also load an info screen full of artist information and photos, album covers and the song's lyrics. The playlist is very easy to follow: even if you add a single song from an album, Musique will automatically give it a separate albums and artist title to make it easy to recognize. Things are also pretty much perfect when it comes to formats. According to its website, Musique takes advantage of VLC on Windows, and thus supports all common audio formats. While at first I had problems playing OGG and FLAC files, the developer promptly fixed these bugs. In general, any format that can play on VLC should also work in Musique. If it doesn't, it's a bug, rather than a design. One glaring problem with Musique is its inability to open any files aside from the folder you've scanned on startup. There is no File -> Open option, and even if you set it as the default music player on your system, double clicking a file will merely open the program, without actually opening the file you clicked on. If your music is concentrated in one central folder, and you don't mind using a different app to open the odd audio file that's not in that folder, you shouldn't run into problems with Musique. These issues aside, there are more than enough reasons to fall in love with the app, and even pay for it. Why pay $11.75 when you can get iTunes or VLC for free, you wonder? Musique is a one-man effort, and is a far better one than most big companies have produced. It's well worth your support. Note: The Download button takes you to to the vendor's website, where you can download the edition of the software appropriate to your system. Despite a few shortcomings, Musique is a wonderful music player that's worth its cost.